MOON TOWNSHIP — The Robert Morris Colonials (12-20-2) beat the Mercyhurst Lakers (13-18-5) by a score of 4-3 on the Colonial’s senior night. Around the league the stars aligned and due to both Holy Cross and Army losses, the Colonials were able to clinch home ice for the first round of the Atlantic Hockey Association playoffs. After introducing the five seniors graduating in 2019, the puck was dropped; and the first period was all Colonials. Jacob Coleman opened the scoring with a second effort as he crashed the Mercyhurst net and slid one five hole through the pads of Colin DeAugustine. Laker Joshua Lammon buried one past Marotte to tie the game at one, and show that although the Colonials won game one of the weekend series, the Lakers weren’t going down without a fight tonight. The next Colonials lead came courtesy of Aidan Girduckis’ first NCAA goal, as he threw the puck on net from the top of the circle, catching DeAugustine off guard and sending the puck into the net. This would lead to the end of the first period of play, and in the second period the game certainly didn’t slow down. Play started to get extremely chippy early on, as bodies seemed to be thrown around more often and harder than usual. Stephen Ipri of the Lakers would tie the game at two soon after the start of the period. Defenseman Sean Giles had an outstanding rush into the Lakers zone, taking a shot and then catching his own rebound before throwing it into the back of the net. The only problem with the play was that the referee had blown his whistle prior to the puck crossing the goal line, and after a short review, the goal was called off. Giles certainly wouldn’t let the changed call sour his team’s night, as he went on to put the puck past DeAugustine just a few moments later. This tally brought the Colonials’ lead to 3-2 for real this time, and Giles’ career goal count to two. At the end of the second, Luke Lynch took a cross check to the throat, resulting in some blood being spilled at the ISC. A gauze patch and a team doctor had him all taken care of after the 20 minute ice cut between periods, and we would see him on the ice in the third. 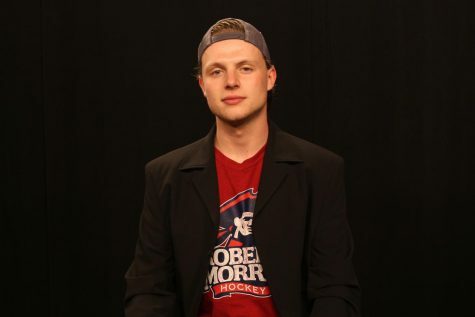 Later in the period, Lynch caught a feed in the high slot -a deadly place for a sharpshooter like himself- and although his shot was tipped by a Lakers stick, the puck slid right past the Mercyhurst goalie, giving the Colonials four on the night. The Colonials had a rough third period, as they couldn’t seem to stay out of the box. The Lakers spent a total of two-fifths of the third period with a man advantage, which would be quite a challenge for the RMU penalty kill. 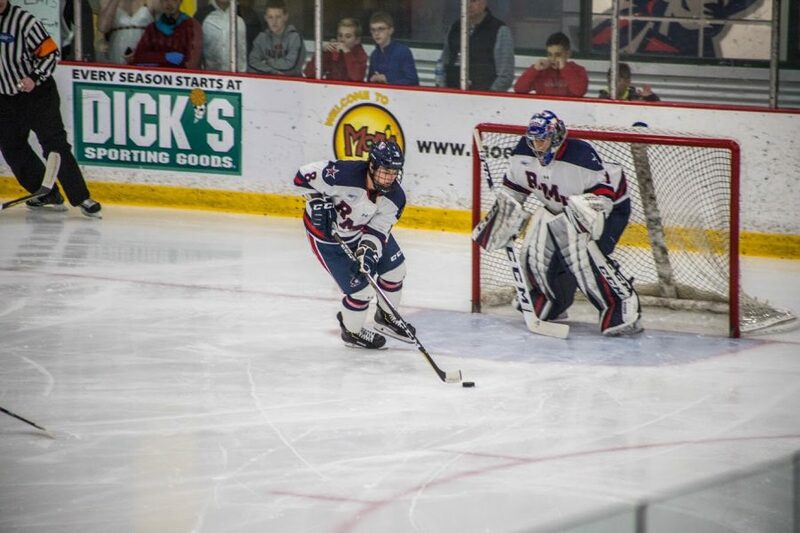 Shot after shot pounded the pads of Marotte, but thanks to a seemingly more aggressive style from the entire defensive core, the Colonials were able to clear the puck time and time again. The Colonials hope some things can continue going their way as they will host Holy Cross in round one of a best of three matchup on Friday, March 9. The Colonials will enter the AHA playoffs as the eighth overall seed this year; and having made the conference finals for the past four years in a row, anything can happen.